Current makes it simple to create an invoice that’s as detailed as you need for the opportunity total or a percentage that you specify. It’s time to get paid! 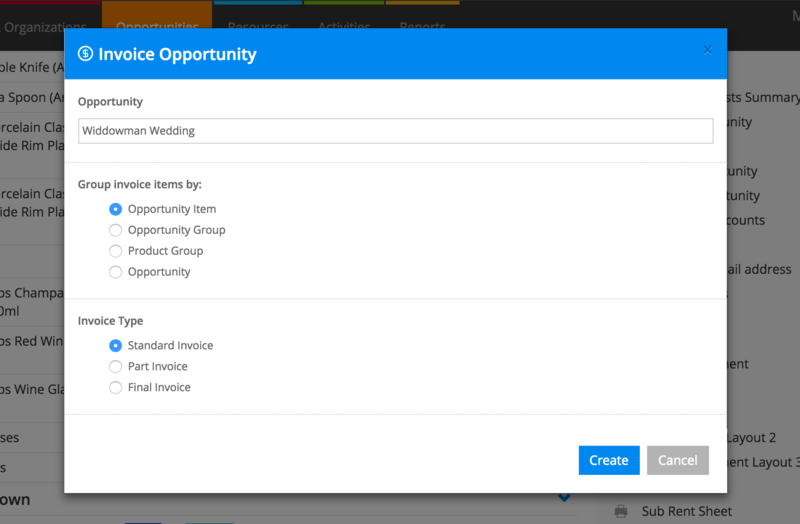 Generate an invoice straight from an opportunity by using the Invoice Opportunity link under Actions. When you invoice from an opportunity, a separate record is created in Current RMS for the invoice. It’s a snapshot of the items on the opportunity at the time that you created the invoice. See: How does invoicing work in Current RMS? 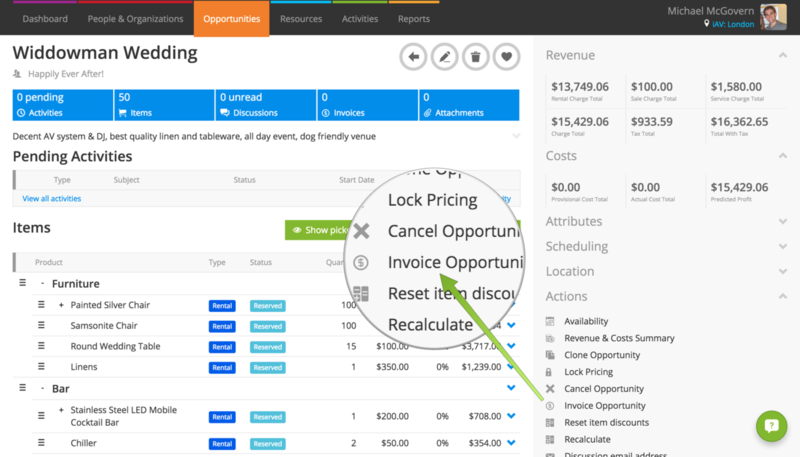 You’ll see any invoices listed on the right-hand side of an opportunity or project. If your opportunity is at order stage, click Invoice Opportunity under Actions to bring up the invoice opportunity pop-up. Don't see the option to invoice opportunity? The opportunity might have been marked as invoiced already or might be part of a project with project invoicing enabled. Check out: Why can't I invoice my opportunity? Next, choose your grouping options and invoice type. Use the “Group invoice items by” options to choose how detailed you’d like your invoice to be. Your invoice will look like the opportunity items list, with lines for each opportunity item and separate lines for any surcharges. Your invoice will be created with lines for each of the groups on your opportunity and the group totals. Separate lines will be created for any surcharges on the opportunity. Choosing product group here will generate an invoice with lines for the each product group added and a combined total for the items in that product group. Separate lines will be created for any surcharges on the opportunity. A simple one-line invoice with the subject of the opportunity and the charge total. Separate lines will be created for any surcharges on the opportunity. Try each of these out for yourself! Invoices are initially created with a status of open, which means that you can delete them easily using the delete icon at the top of the invoice without affecting your invoice numbering or revenue. Only issue an invoice when you’re happy with it. To generate an invoice for the entire opportunity, choose “Standard Invoice”. This is the default. You might like to add products, services, or text items to this invoice that weren’t on the opportunity or project. Use add new invoice item to do this. Invoices are created with the status of Open, this means that they’re essentially draft invoices and can be deleted. They don’t have an invoice number. To issue your invoice, making it final and issuing a number, hit Issue invoice under Actions. Made a mistake? Void an issued invoice to start over. Create an open credit for this invoice.